1. The seed is no longer fresh or has gotten wet. Exposed to sun and humidity, seed is good in a feeder for only 2-3 weeks. If rain has seeped into the feeder, seed will spoil in just days. Much like we humans are reluctant to revisit a restaurant where we’ve had a bad experience, the birds will also avoid a “bad” feeder. Until the birds are eating well, place only a small amount of seed in the feeder and change it regularly so that it is still fresh when they finally discover the feeder. 2. The feeder is new or has been left empty for a while. Birds locate food purely by sight, so while birds may notice the food right away, it could also take them a while. Three-four weeks would be average for an all-purpose feeder; possibly twice that time for a specialty feeder. Being prey species, birds can be wary of new objects, so even a shiny new feeder replacing an old one may require an adjustment period. 3. Patience is needed in some habitats. While birds can be attracted nearly everywhere, a new feeder in woodlands will be noticed faster than one in a new subdivision or in the middle of farmland void of large trees. Ask WBU what feeders will work best in your habitat. 4. Seed is stored improperly. As with human foods, heat and humidity will spoil seeds. Buy no more than you can use in about 6-8 weeks, and don’t store it in a hot shed or garage. If you have no option but to store it in a less-than-ideal location, buy only about two weeks worth at a time. WBU gets 2 fresh shipments each week, so you know our seed is fresh when you buy it. 5. The feeder is dirty. 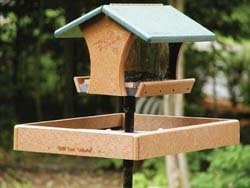 A dirty feeder can harbor mold and bacterial, which is unhealthy for birds and will make new seed spoil faster. Wash feeders monthly. 6. The wrong seed or blend in being used. The wrong feeder/seed combination can result in poor bird activity. Each species of bird has its favorite foods, so getting that right is an important start, and not all feeder styles can dispense foods equally, meaning even the right food in the wrong feeder will make the food inaccessible. Ask the experts at WBU to help you choose. Note: WBU seed blends never contain junk grains like those often found in discount store blends. Most songbirds avoid these fillers altogether. 7. Predators! A hawk lurking around will make birds scarce. As hunting becomes more difficult, hawks tend to move on. After a few weeks, the songbirds usually return. Outdoor cats can also be an issue. Ask WBU for additional advice. 8. Feeders are located too close together or in species inappropriate locations. Some feeders styles can be grouped together, while some specialty feeders, such as finch feeders, work best when 10 feet or more from other birds. Each bird species has its favored feeding spots. For example, woodpeckers will be happiest near trees, while goldfinches will typically prefer to be out in the open. 9. Natural cycles. Birds feed at feeders all year long, but activity will be highest during bad weather and during nesting season. Birds may visit less if natural sources are abundant (examples: finches love ripe coneflower seeds, and jays and woodpeckers feast on autumn acorns). Yards with little natural cover for protection may be quiet during winter winds. 10. Feeders are Broken/Defective/Wrong Style. Occasionally we see feeders in non-usable states of disrepair or ones so poorly designed they aren’t functional. Thankfully, if one or more of these reasons apply to your feeders, the remedy is usually pretty simple and you should have birds returning soon enough. Please stop by and see us at Wild Birds Unlimited for more detailed assistance or for a bag of fresh WBU birdseed. Home > Bird Feeding Tips > Why Aren't My Birds Eating?